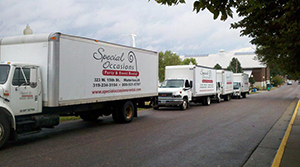 Special Occasions Party & Event Rental has been serving the Cedar Valley area for over twenty years. Located right on US Highway 218 in Waterloo IA, we rent just about everything imaginable for truly memorable weddings, reunions, banquets, graduations, conventions, or any other event that requires first class equipment and service. Special Occasions also provides inflatable games and concession equipment if you are looking to create a carnival atmosphere or just have a fun birthday party for your child. You may pick up what you need, or we can deliver, set up, and then return to pick up your rentals when your event is over.